On Tuesday morning, the Nigerian Women's bobsled team, led by Seun Adigun and Akuoma Omeoga became the first Africans in history to compete in the bobsled competition finishing in 52.1 seconds and landing in 20th place in Heat 1. Enthusiastic supporters from across the globe rooted for the team as they wen on to make Olympic history. They'll compete again tomorrow in a second round of competitions. Nigeria's first ever skeleton racer, Simi Ageagbo made her Olympic debut last week as well, finishing in 20th place after competing in four heats. She made the trip to Pyeongchang just four months after picking up the sport of skeleton racing. She'll go down as another African athlete who's helped make winter sports that much more accessible for black athletes. "Ultimately, my journey is about breaking down barriers for future generations of athletes—especially young women everywhere—who are watching athletes like me push the limits through sport during the Games," said Adeagbo afterwards. OkayAfrica got the chance to catch up with the athlete ahead of the games. Learn more about her story below with the video "60 seconds with Simi." 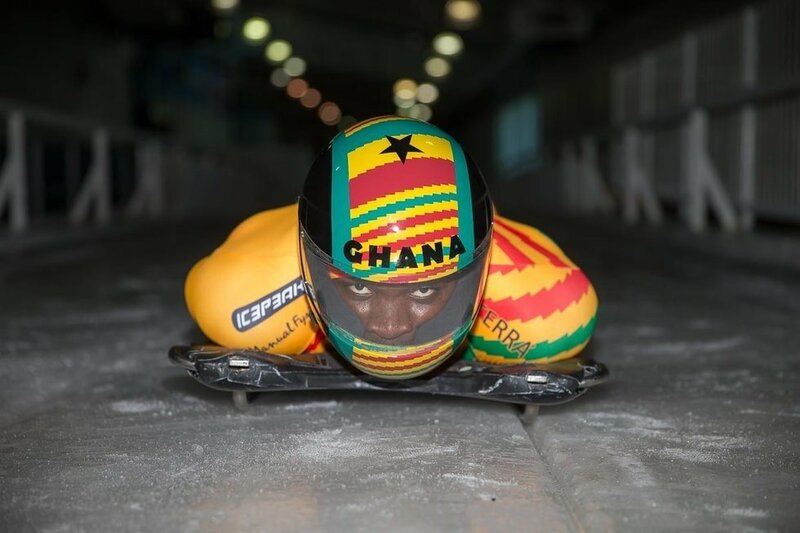 The same can be said for Ghana's first skeleton athlete, Akwasi Frimpong, who competed last week, finishing last overall, but leaving a huge mark on the sports world nonetheless. Revisit the talk we had with Frimpong just ahead of his first race, where he discusses his transition from track athlete to winter sports trailblazer. "Everybody has their own story. I am just grateful I didn't give up. I just hope a kid in Ghana sees me sliding today and they will go after their dreams as well," the athlete told ESPN following his race. "They need it, I need it." Photo courtesy of Akwasi Frimpong. Eritrea's first Winter Olympian, 21-year-old alpine skier, Shannon-Obgnai Abeda, finished 61st. He's made Eritrea proud by proudly representing his country on a global platform. "For Eritreans, they're very happy when they see something positive about Eritrea, considering there was a 30 year war of independence," said the athlete, speaking with Global News Canada. "I think it would be good for me to connect with the youth there and try to promote sports regardless if it's a summer or winter sport." Sabrina Simander, the first Kenyan woman to compete in the Winter Olympics, and the second Kenyan ever to compete at the games, finished 38th out of 44 in speed skiing. The 19-year-old athlete, who grew up in Austria, has been skiing since the age of three. "It was pretty cool and amazing to be at my first Olympics at 19 years. I felt really proud and enjoyed it. It was a big deal for me," she told Capital FM. She, along with the several other African athletes who participated in the Olympic games, wants to giver back to her community in a meaningful way through sports. "I am ready to share my experience with other Kenyans who are willing to take up winter sports. There are lots of experiences I have picked up from the Olympics and lessons I am certainly hoping to share," she added. Congrats to all of the history-making African athletes who conquered the Winter Olympics this year.